Learn the basics of the newest battle royale game. Respawn Entertainment’s Apex Legends has taken the gaming community by storm since it was released on Feb. 4. Fans of many different games are taking the time to test out the newest smash-hit battle royale title. But if you’ve never played a battle royale game before, certain aspects of Apex Legends definitely could be confusing. Which character should you play as? Where should you land on the map? Which guns should you use? Here’s everything you need to know about Apex Legends if you’re playing for the first time. Apex Legends is a free-to-play battle royale game that’s available on PC, PlayStation 4, and Xbox One. At launch, the game only has one map: Kings Canyon. This map can feature a maximum of 60 players playing in teams of three. The objective of the game is to be the last team standing. You’ll start in a drop ship flying over the Apex Legends map. Once you and your team pick a landing spot, your goal is to collect loot (weapons, armor, etc.) and fight enemy squads. While you’re looting, you also have to be aware of the ring. A circle will surround the map and close on a certain location every few minutes—if you’re caught outside of the ring while it’s moving, you’ll take damage. The ring will get smaller and smaller as the game progresses, creating less of a safe area for the remaining players. If you’re the last team standing, you’ll be crowned the Champion. But before you can win a game of Apex Legends, there are a lot of features that you’ll need to know about. Each Legend has three unique abilities: A passive, tactical ability, and ultimate. Learning about the abilities of each Legend will be extremely important to your success in this game. Start out by picking one Legend to play and try to learn everything that they have to offer—we recommend Lifeline for first-time players, since her abilities are extremely simple. Once you get a better feel for the game, try more characters and see which ones you enjoy playing the most. 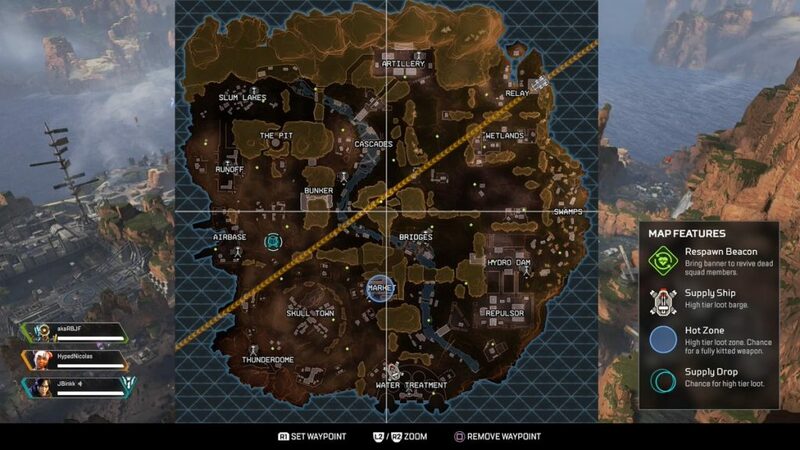 Compared to other battle royale games, the Apex Legends Kings Canyon map seems relatively small. There are 17 named points of interest on Kings Canyon, as well as several unnamed areas on the map that also contain weapons and other loot. The in-game Apex Legends map also has a box on the right side that describes some of its features. The green diamonds are Respawn Beacons, which allow you to revive your dead teammates. The white floating craft is the Supply Ship that moves around the map and contains high-tier loot. 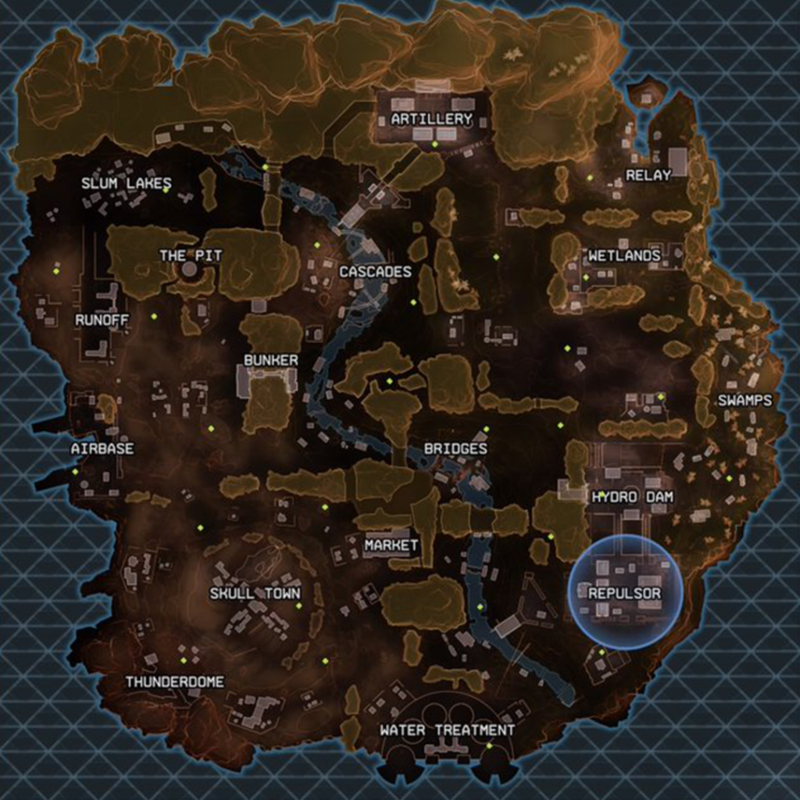 The blue circle is the Hot Zone, which is different in each game and provides high-tier loot, as well as the chance for a fully-kitted weapon. The two teal circles on the map indicate where a Supply Drop is landing. Understanding the map and its features is absolutely essential to your survival in Apex Legends. There are 19 weapons available in Apex Legends at launch: Three submachine guns, three assault rifles, two light machine guns, four snipers, four shotguns, and three pistols. There are multiple different types of ammunition, too—certain guns only work if you have the correct ammo for it. There are light rounds, heavy rounds, energy ammo, and shotgun shells. Make sure you have the right ammo for the weapon you’re using in each game so that you don’t run out of bullets in the middle of a gunfight. Although some guns may be better than others statistically, we recommend trying out all of the weapons in Apex Legends. See which ones you like the most and try to get as comfortable with them as possible. For starters, we recommend the R-301 assault rifle and Peacekeeper shotgun. Apex Legends is a very team-oriented game—you won’t find much success if you’re a lone wolf taking on multiple three-man squads. Make sure to stick with your teammates as much as possible. When you’re looting, it’s important to pick up items other than weapons, such as body shields, helmets, healing items (shield cells, syringes, etc. ), and utility (frag grenades, thermite, etc.). These things will be crucial to your survival in and out of fights. If you get killed, don’t worry—your teammates have the ability to bring you back to life in Apex Legends. All they have to do is pick up your tag and deliver it to a Respawn Beacon. You’ll be brought back to life without any of your items, though—so make sure to loot quickly after you respawn. The most important aspect of Apex Legends is learning how to work with your teammates. The game features an amazing ping system that allows you to effectively communicate with your teammates, even if they don’t have a mic. Being a team player is crucial for any beginner who wants to become an Apex Legends Champion.